This topic has 17 replies, 15 voices, and was last updated 2 months ago by chakaping. Just looks to me like it’d fold in the middle! No doubt it isn’t but it has a very “fragile” look to it. I assume the Boxxer has been shortened in some fashion? At least that would be graceful. I’m more worried about the headtube tearing off. Just looks like somebody’s chucked some dh forks on a trail bike! Mine is now 160 front and back after changing to a 210×57 DHX2 and swapping the fork shaft. Still has plenty of clearance on the back end even in low mode, you could go for 170mm+ rear travel in high mode. I couldn’t really tell from the pic is that Carbon or Aluminium? Is itintended as a sort of “Mini DH” bike? A bit like a few companies sold before Enduro was really a ‘thing’ rather than a full fat replacement for a Demo? Was there any indication on price when you saw it? I saw it on my local bike shop’s facebook page. I really dont know anything more about it other than it’s aluminium and they are gonna ride it! Is that definitely an Evo , it doesn’t look slack enough to me even taking into account the fact that the back wheel is on a stand . 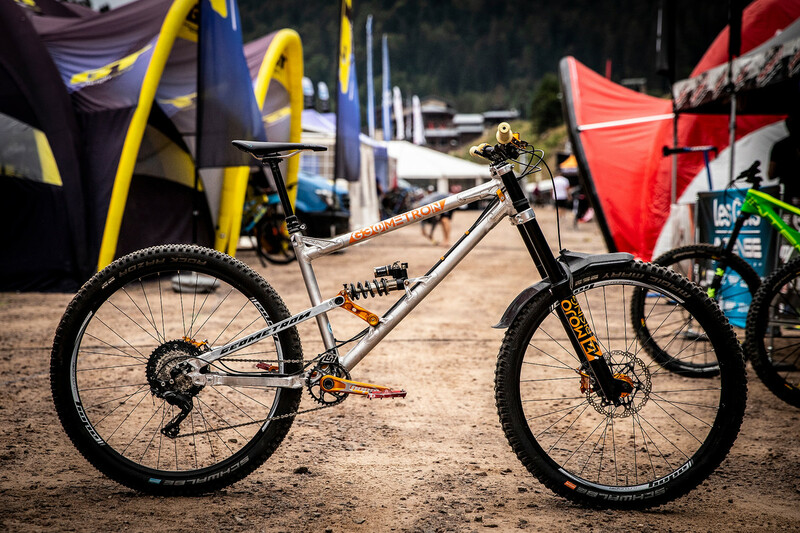 I don’t know anything about the bike in the picture but dual crown forks are going to creep onto Enduro bikes. That’s my prediction for 2020 anyway. is a stumpy a trail bike really? Judging by the build, super high bars, DJ saddle, tiny cassette, I assume it’s a sponsored riders bike for a freeride event. That looks awful, the Evo looks lovely with a single crown fork empathising the slack head tube angle. You know some bikes just look “right”?